Seen in front of the Reclining Buddha (the solid gold seen in the rear is perhaps the midsection/thigh). You are reminding me that I have not visited Wat Pho for a few years, Ayush? Ayush Basu: I would certainly be interested to view any of your views of Bangkok minus the touristy filter, no matter if they are inside or outside the Wat Pho. The Buddha in front of the Buddha... many of them about! Your angle leaves it's size to the imagination, if it weren't for your description! Ayush Basu: Oh yes, the scale is missing from purely the photo. Thank you on that input Elizabeth! Tranquility personified Ayush: pity about the sign..
Ayush Basu: Yes Chris, it seems an obvious in-your-face reminder is needed once in a while. Ayush Basu: Thank you very much Juan Carlos and the very same to you. Sorry for the late reply. A sacred place indeed and too bad there needs to be a sign to remind people where they are. Ayush Basu: I wonder if it was not obvious to some visitors earlier leading to perhaps some undesirable incident thereby necessitating the installation of such a sign. Thank you for that thought, Astrid. Actually > the sign is my favourite part. Ayush Basu: It is mine too Jacquelin, thank you. Such detail in most of the decorative features in the Thai sacred spaces. The lotus blossoms really grab my eye here. So well taken, Ayush. Ayush Basu: Thank you very much Mary. 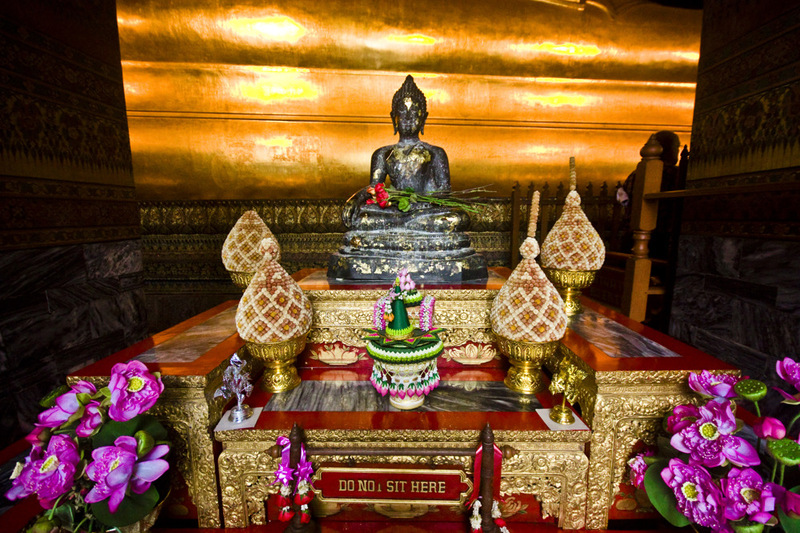 You are quite right, the sacred places seem to be well regarded and respected in Thai culture. Ayush Basu: Thank you very much Lisl. Happy new year Ayush ! Ayush Basu: Thank you very much Emma, bonne année. Happy new year to you too. Lovely intricate details and design. The golden tones are beautiful along with the rich colors of the flowers. Excellent capture!